Pulling down the crown with a phenomenal performance, @yusaymon! Can't get over how perfect this song was for you! Congratulations! Here is his outstanding winning entry: "Give me Mambo / Los Amigos Invisibles"
Our second place prize this week goes to goes to the unseated former champ, @rodeo670! Good job! He chose The Impossible Dream from Man of La Mancha and it was amazing!! Thank you to everyone who entered. We look forward to another week of fun and games! We can't wait to hear all the lovely voices and what songs they choose to sing :) So, show us what ya got and what ya love! Then, drop your video and/or link to your post with the video of you down there in the comments section. Easy, right? Here's 'the catch'. The 1st tag for your submission post must be #karaokecontest. This submission thread must be upvoted (if you would like more competition, please resteem it). Your video of yourself singing must be in comments of this post (so you can get the popularity vote), or at least a link to your Steemit post entry. Popular vote: This will carry 40% of the overall score. Whoever has the most upvotes (not reward amount for the post) in the comments below, will win the popular vote. You may only vote for yourself ONCE, purchased bot votes for yourself will not count. Timing: 20% weight - how close you are to the timing of the original lyrics. Pitch: 20% weight - how close you are to staying on key to the original lyrics. Likeness & Performance: 20% weight - how much you actually sound like and embody the singer of the original lyrics. We have prizes for 1st, 2nd & 3rd places. 10 SBD for first place, 7 SBD for second place, and 3 SBD for 3rd place. The winners will also have their entry posts NOMMED on by @killerwhale and resteemed so everyone can see your slick singing skills! 'Major', @topkpop has agreed to continue her passion for musical talents and stay with us on the judging panel. Other members of #thealliance will also be joining in on the fun including the project brainchild @enginewitty and one of the leaders of our Spanish Syndicate, 'Commander' @sol25. 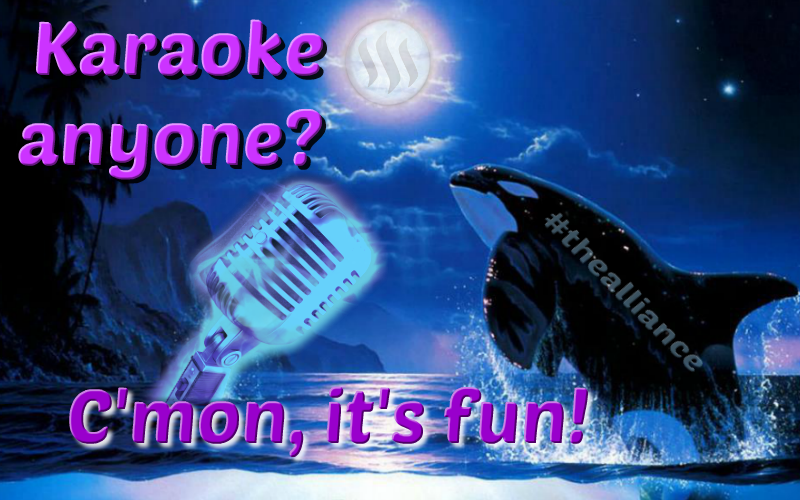 We always accept contributions, just send them to @killerwhale and add 'Karaoke Donation' in the memo. This really is fun everyone, we're having a blast! This is all made possible by the fantastic community and involvement we have here on Steemit. Huge kudos to @enginewitty for the vision and @michaeldavid for helping orchestrate this contest. Big hugs to all our fellow allies that help out with donations and spreading the word. Music is an art and a passion of ours and we would now like to bring up our strongest supporters and think you should give them a Shout too! 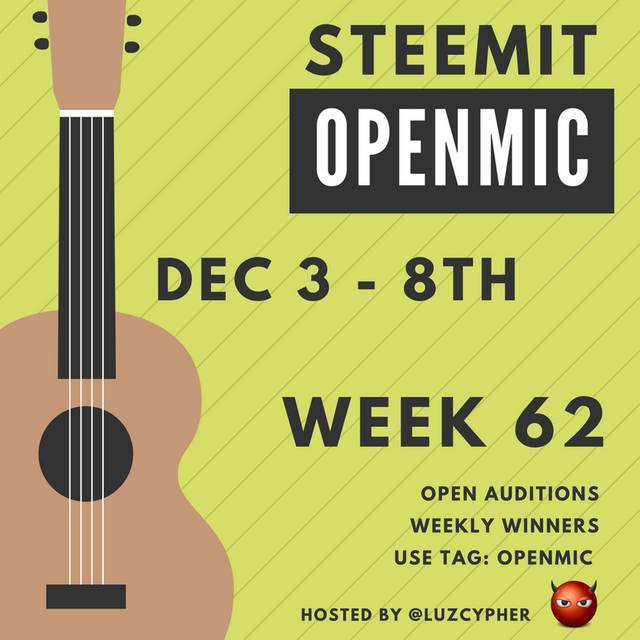 Look into the Open Mic contest, sponsored by @pfunk and hosted by @luzcypher! Support your favorite artists by stopping in to see their entries and show them some love! They are now in week 62 and have been a nonstop thing of beauty in the progress of the musical community here! Our own @donatello has an entry this week, stop in and check out his mad musical skills! Do you like to dance? 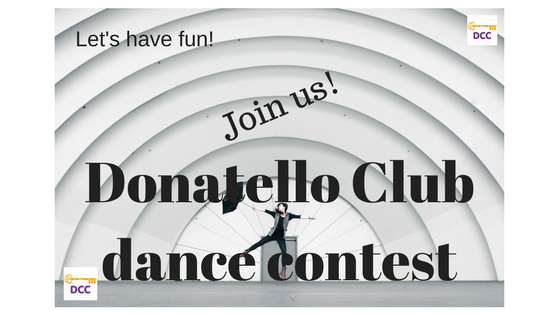 Stop in here to check out @donatello and his 19th weekly dance competition! I would love to see people get in on this. C'mon...you know you want to! Don't get cold feet now, you'll trip over them out there on the dance floor!! You love those Lo-Fi, uncut, get-down-with-your-bad-self beats? Throw some jazzy poetry on it! Or spit some game! Can even sing if you want! Just get over there and do it! You already know @termitemusic has you completely covered with the Worldwide Cypher Jam! You ever tell yourself...you know I would have totally ripped that beat a new one? Then @kenentertainment has just what you need! This Challenge lets us hear 'what would you have spit' on some classic fire beats! Stop over there and have a look see! Can't wait to see all the entries this week! Tap/click here to join his curation trail! Follow his votes as a curator! Wow, congratulations @yusaymon! You beat me fair and square with your music video! :P This week though I'm coming in hard and rallying the troops for real, so I'm hoping to take back my crown! You can read more about my decision to sing a Tagalog song here. You got me a pretty smile, my friend !! :) a smile that things can be as they should be !! we are all champions :) the heart that you put to your song has an indescribable value. You voice is not too shabby either, sweetie. Good job! I love your singing! So emotive! I don't understand the words but I can feel this. Well done. Hi guys. My cold is still not quite gone, but I couldn't stay away any more. I decided to sing one of my all-time favourites: Hallelujah. Here is my original entry post! Love it. Love you too! Great entry. Oh, Jhagi, and you give such good hugs!!! The bestest entry right here! I'm so glad to see you're still going strong with the Karaoke contest and appreciate the work you put into it, man. Great job and I'm still promoting you. In fact, I talked about this contest tonight on the new radio show for Open Mic that @msp-music started. They are part of the Minnow Support Project. You should get on there next week. If you want I'll introduce you. Excellent, thank you!! I will be sure to make a point of it, that'd be great. Send me a message on discord with the details, i.e. time etc. so I can have it handy in the same place. You're awesome bud! Ohhh !! Karaoke itś my jam my everything! Very nice congrats @g10a. you should always keep singing because @killerwhale is a great and generous Man. hahaha na ukal jud tawon ko boss karl. Ayawan na. May nanalo na! Whoaaaa 🙌🏻🙌🏻 Go Sir @g10a! galing talga nadali sa karaoke . Hi!! Friends! be careful with "The Dogs" in this *🎤 Karaoke NOM NOM! Thanks for the promo my guy!!! Uhm yeah! I'm looking into ways to take advantage of my still slightly sandpapery voice. Beware! everyone should win, just for trying.